Special Containment Procedures: SCP-1176 is to be kept within the sarcophagus it was recovered in, fully submerged in SCP-1176-1, in a secure, climate-controlled observation room at Site 73. SCP-1176 is not to be removed from SCP-1176-1 for any period of time longer than is necessary to conduct essential research or replace monitoring equipment, in no case exceeding six hours. SCP-1176 is to be monitored by EEG at all times when not fully submerged in SCP-1176-1 for any sudden changes in brain activity. Any unexpected changes in SCP-1176-1 production are to be noted. Excess SCP-1176-1 is to be drained from the sarcophagus using the attached faucet, once per day or as necessary to prevent overflow, and is to be destroyed or sent for testing immediately. SCP-1176-1 is to be transported and stored in vessels clearly indicating that it is not a food product and is inedible. SCP-1176-1 is not to be consumed by any incompatible person except for testing purposes. All requests to issue SCP-1176-1 as an emergency field ration are preemptively denied, regardless of individual compatibility, pending a full Ethics Committee review. Description: SCP-1176 is the mummified corpse of a human male, presumed to have been approximately 35 years of age at the time of death. Severe tissue degradation has made DNA examination of SCP-1176 impossible; based on contextual evidence, SCP-1176 is assumed to have been of Arabian ancestry and to have died in the 10th-11th century AD. SCP-1176 is clinically dead and does not display any indications of respiration, circulation, or metabolism. SCP-1176's brain, which is largely intact in spite of general tissue degradation, exhibits a constant level of electrical activity consistent with stage 3 non-rapid eye movement sleep ("deep sleep"). In the place of all bodily fluids that would be found in a living human being, SCP-1176 contains a fluid of viscous consistency and golden color, designated SCP-1176-1. Testing of SCP-1176-1 has found it to be chemically identical to clover honey produced by the Anatolian honey bee (Apis mellifera anatoliaca). SCP-1176-1 is exuded from SCP-1176's pores at a variable rate depending on environmental conditions. When kept fully or mostly submerged, as it typically is when stored within its sarcophagus, rate of SCP-1176-1 production is approximately 0.2 liters per hour. When it is not submerged, production increases exponentially over time (see Incident 1176-1 log). The quantity of SCP-1176-1 contained within SCP-1176 itself has not been documented to increase or decrease at any time, regardless of the rate of production. SCP-1176-1 has been determined to be edible by human beings possessing an AB+ blood type, and possesses properties consistent with a highly concentrated nutritional supplement. A dose of SCP-1176-1 15 ml in volume contains approximately 2500 kcal and significant quantities of essential vitamins and nutrients, making it highly effective as an emergency ration or staple foodstuff. Tests conducted on D-Class personnel indicate that SCP-1176-1 consumption by compatible persons is effective in preventing physical sensations of hunger for 14-18 hours after consumption and bears no long-term side effects. Persons of a non-AB+ blood type, upon consuming any amount of SCP-1176-1 greater than 0.5 ml, begin exhibiting symptoms of a severe allergic reaction within four to ten hours of consumption. Acute hemolysis, followed by renal failure and death, has occurred in 98.7% of all tests where an incompatible person was fed SCP-1176-1. Symptoms of SCP-1176-1 consumption among incompatible test subjects are consistent with symptoms of persons given blood transfusions of a type incompatible with their body chemistry. At the time of its recovery, SCP-1176 was stored within a stone sarcophagus of late Hellenistic style. The lid, sides, and interior of the sarcophagus are inscribed with texts in late Egyptian hieroglyphics, largely consisting of ceremonial texts and spells regarding the protection of the person entombed within and hagiographic descriptions of various gods, and an extinct and thus far untranslated dialect of Proto-Arabic. In a large section at the foot of the coffin, the original inscriptions have been obliterated and replaced with two separate inscriptions in Classical Arabic (see addendum for translation). 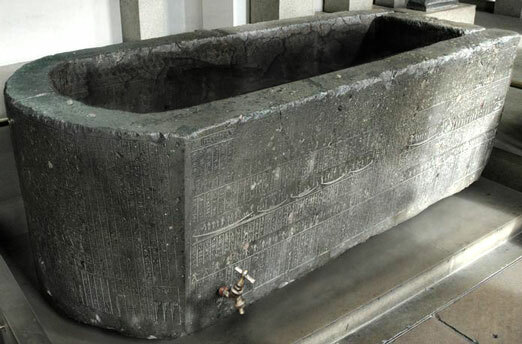 A hole has been drilled into the sarcophagus near one end, into which a copper pipe and a spigot has been fitted. It is hypothesized that the spigot was installed within the last 100 years by the persons previously in possession of SCP-1176 for the purpose of facilitating the removal of SCP-1176-1 from the sarcophagus. The sarcophagus itself possesses no anomalous properties. SCP-1176 was acquired by the Foundation in 1985, following a raid on a facility in Asmara, Eritrea (then Ethiopia) owned by the Manna Charitable Foundation. Foundation assets in the region had identified the facility as the source of shipments of honey which had been widely distributed to famine-stricken regions of Ethiopia, resulting in the deaths of approximately █████ civilians from symptoms resembling acute hemolysis. How the MCF came into possession of SCP-1176 has not been determined to date. Abdallah ibn Salah ibn Ayyub ibn Nasir, fifteenth son of the great sheikh (illegible), was put to the fast of honey on the first of Rajab in the year of the Hijra 3(illegible),1 and died on the fifteenth of Ramadan. The great imam al-Yusuf has sealed him within the ancient vessel, marked with the signs decreed by the ancients, to ferment in honey for one hundred years and bring aid to the people in time of need. Beware, imam, for the mark of Iblis is upon this one! In the year of the Hijra 573,2 the imam al-Malik ordered this vessel opened, thereby to feed the people during time of great famine. Many jars were filled and delivered to the sheikh and his court, to the great imams of the mosques, and to the people. And in the following day, a great many people fell ill with a terrible fever, and none of them lived - but the sheikh, and his brothers, and his sons, who ate heartily of the cursed nectar, were all of them unharmed. Those who lived declared the sheikh and his family guilty of sorcery and (illegible). But when the people came to destroy the body taken from the vessel, they found it standing upright and dancing about, screaming and mocking them. Al-Malik has decreed that a foul djinn has been sent by the Shaitan himself to corrupt this instrument of healing, and has decreed that it be sealed within this vessel until the last day. May God strike down any who would break these seals. Incident 1176-1: On ██/██/20██, an experiment was conducted to determine the upward limits of the rate at which SCP-1176-1 can be produced. SCP-1176 was removed from its sarcophagus and placed upon a grated surface designed to drain all SCP-1176-1 produced away rather than allowing it to accumulate. After increasing to a rate of 1.2 liters per hour after the first hour, the rate at which production accelerated continued to increase by approximately one liter per hour, reaching a production of approximately 55.7 liters per hour. After approximately 10.5 hours, a sudden spike in brain activity was detected and SCP-1176 became conscious. SCP-1176 opened its eyelids and began flailing wildly and attempting to engage in distressed vocalizations, and attempted to crawl towards one of the walls of the test chamber. Due to the atrophied state of its internal organs and musculature, it is speculated that SCP-1176 was unable to see or derive any meaningful sensory data from its environment during this period, and was unable to speak coherently due to the degradation of its tongue and palate. As the staff were concerned that SCP-1176's movements would damage itself, four junior research personnel were instructed to manually restrain SCP-1176 and sedate it. During the attempt, SCP-1176 jerked its left arm violently, resulting in its hand being severed at the wrist. After attempts to sedate SCP-1176 using gas and intramuscular injection were unsuccessful, research personnel were instructed to return SCP-1176 to its sarcophagus and set the lid in place. SCP-1176 was heard continuing to vocalize, and to strike the interior of the sarcophagus with its limbs and head, for approximately 3 hours, after which time it ceased activity and returned to its previous state. Subsequent examination has detected multiple bone fractures induced during SCP-1176's period of activity, as well as several previously unnoted fractures speculated to have been caused by an earlier such state. SCP-1176's severed hand has continued to exude SCP-1176-1 at rates commensurate with the rest of the specimen and is currently being contained separately for further research.